the start of Aura, City of Colour! Be a part of this awesome new city. First stage is open right now! AURA, (formerly Caloundra South) City of Colour, a massive development now well under way at the Southern end of the Sunshine Coast. Now in its third year of its proposed 35 year duration. A brand new city the size of Gladstone with over 20,000 brand new homes to be built to accommodate the 50,000 new residents who intend to call Aura and the Sunshine Coast ‘home’. Aura, being developed by Stockland, Australia’s largest land developer is designated to become a ‘city of the future’ with infrastructure to benefit each and every member of its community Over 700 hectares has been allocated to conservation areas and parks, a network of cycle ways stretching for over 200 kilometres will provide safe passage for young and old alike, and of course for those in between. More than 20 new educational facilities including a university are proposed within its boundaries. Baringa, the first suburb of Aura with over 1,500 home sites is nearing completion, its State Primary School opened in January this year (2018), it will specialise in developing the young ones understandings of Science, Technology, Engineering and Maths (STEM) as they excitingly begin life’s journey. 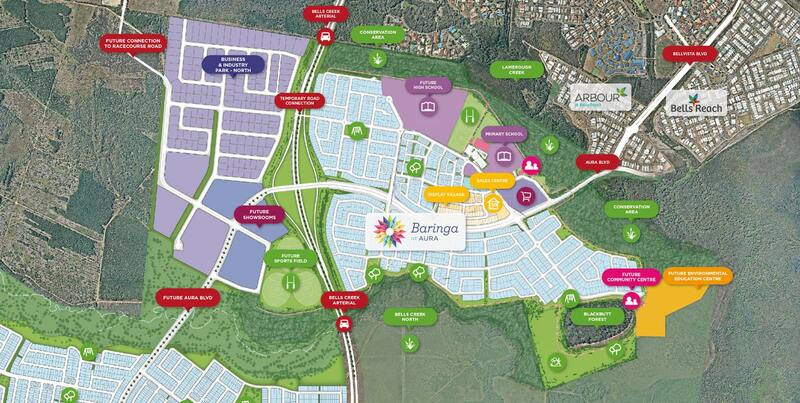 Baringa is the very first of an interconnected network of villages that will form Aura, Australia’s largest masterplanned community. Designated cycle paths and numerous wide footpaths are already in place providing early residents with a myriad of locations to explore and many more as this exciting city of the future evolves. Houses are under construction by local private builders and available as Baringa nears completion, contact Paul Kelly for a current list of available houses or a detailed inclusion list of those that may be of interest to you.